With his first road race for almost two decades behind him, Alexi Grewal can truthfully say that life begins at 50 — well, life as a racing cyclist aiming to return to the top. With his first road race for almost two decades behind him, Alexi Grewal can truthfully say that life begins at 50 — well, life as a racing cyclist aiming to return to the top. He duly survived the four-day Callville Bay Classic last weekend and is now competing with the Pro/1 field in California’s Merco Classic, another four-day stage race, which ends this Sunday. But just surviving and competing is not Grewal’s goal. He wants to be beating the best domestic pros before too long. VeloNews caught up with the 1984 Olympic gold medalist during a five-hour training ride at his home in Loveland, Colorado, before he left for the race in Merced. VeloNews: So how did it feel to be in an elite-level race again after such a long break from the sport? Alexi Grewal: The first stage was a little bit of a shock. Plus I had a cold and my left leg cramped in the hard sections. I just didn’t have any training for a change of pace and that intensity. It was crosswind all day. I got dropped three times so I had to get organized … and the third time I thought, “That’s not hard to get back on.” But I then got dropped with about 10K to go. It was a 50-mile race, and I did 40 miles before the race and 30 miles after the race, sort of got loosened up. VN: What about the 4-mile uphill time trial? AG: I just went as hard as I could and still dropped a minute to the best guy. I rode my road bike; they rode TT bikes. And I did two hours training before and two hours after. VN: Then came the 83-mile road race. I heard it was cold and wet. How did that go? I just talked my way onto the race leader’s wheel. Almost his whole team (Team Exergy) rode tempo and I was just parked on his wheel forever. That just kept me in the sweet spot … but two or three guys were fighting me for that spot, and I crossed the yellow line. I got a warning. Then, after a turnaround, we headed into a head-crosswind for the last quarter of the race. I was battling with three or four guys, and I ended up about four spots back of the race leader, about six bike lengths. I was gonna move up and take my spot back right when we hit the crucial section — it was all in the gutter, it was splitting, a climb — and I crossed the yellow line to get back on my wheel. And the commissaire came up and said, “Drop back to the very last guy!” So right when the race was in a critical part, I had to drop back to the back of the field. I chased hard to catch the main group but 15-20 guys rode away and that was it. VN: The Callville race ended with a one-hour criterium. Someone tweeted they were impressed with your rolling along in a big gear just like the old days. How was that? AG: Well, the morning of the crit I rode 70 miles and by the time I’d finished the crit I had another four-and-a-half hours in my legs. So I was better than the results, and I came along pretty quick, felt fine, and did a stack of miles in those four days. VN: How were the climbs? AG: It wasn’t really a climbing race. It was a test of conditioning and you needed a lot of power because of the crosswinds. I’m not fast yet, and in the crit I rode 25 to 35 riders back the whole way. There were some pretty good surges and I had to keep up and stretch the rubber band 60 times sprinting up a hill … it wasn’t that bad. VN: This weekend’s race at Merced has tougher stages and a longer time trial. Will you use your TT bike? AG: It’s not set up yet … and I’m gonna do the TT for training. I’ll ride 100K before the TT and then ride the TT. I’ll try and maybe have clip-ons for my road bike. But I’ll ride all these races the same way that we used to ride the early season (in the 1980s). In a way, at Callville, when the ref pulled me off the front group that was probably good for me because if I’d finished in the front I’d have probably ridden home and not done the 70 miles before the crit the next day. So I’m just gonna ride pretty conservative at the Merco Tour. If I’m good at the end of the last (120-mile) stage I’ll be at the front of the group. But in the first stage there’s a lot of climbing: I’ll try to stay with the first main group, but I’m not gonna try to go with the break; I don’t see any reason to. And in the crit I’ll just find a place with good draft, and no crazy guys, and get to the finish … and ride some extra miles beforehand. VN: Finally, Alexi, how did feel to race with guys who weren’t even born when you won the Olympic road race in Los Angeles? AG: The reception was just awesome. The guys were great and it was just fun to ride with the kids. They treated me like everyone else, but I wore a different jersey each day so I don’t think everyone knew me. I was just one of the guys. I just rode safe. Callville’s a little different from an NRC race because it was a family race. I stayed with the promoter, hung out with him and his kids. And I got invitations from other races and to ride with different teams. It was just fun. And I’m not really that tired … even though I did 32 hours of training in the week before I went. 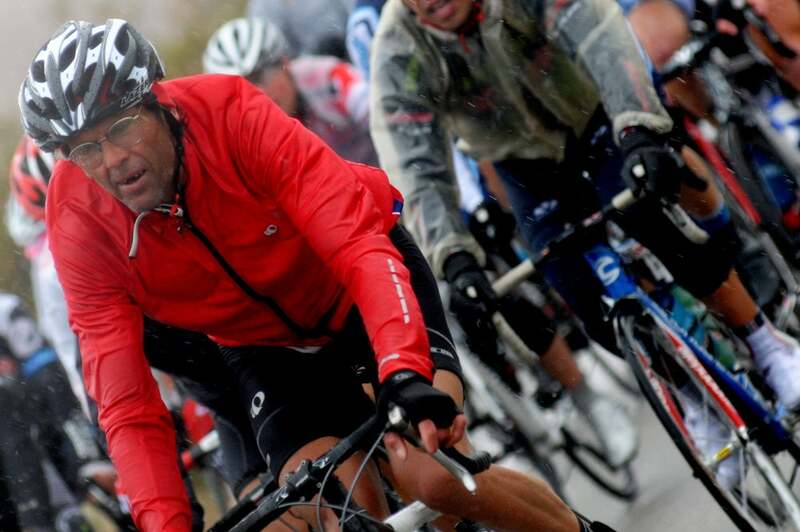 Getting in the miles has figured large in Grewal’s comeback to a peloton he left at the end of the 1993 season. Officially, in his first race in more than 17 years, he was 33rd in the Callville Bay Classic. It was just a start. And hearing his enthusiasm on returning to bike racing at age 50, for Grewal, a new life is beginning.